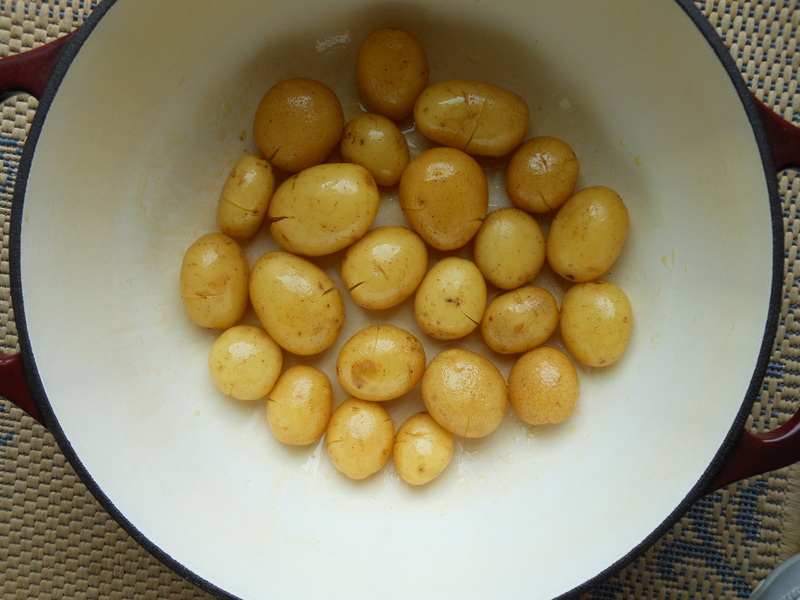 Tom brought home some lovely little Yukon gold potatoes last week. They were the size of golf balls, about two bites each. I decided to bash the heck out of them. When you whack a whole, skin-on potato with just the right amount of force, they crack but remain otherwise intact, enabling the cooking liquid to moisten the interiors without turning the potatoes to mush. Then there’s the aggression-releasing rush that always comes with smashing things with virtuous intent. I use the flat side of my tenderizing mallet, but a rolling pin or the bottom of a heavy skillet will work quite well too. As long as the potatoes are small, and roughly the same size, any type will do. Baby reds are terrific this way, as are fingerlings. It’s important to leave the skins on, or you’ll end up with mashed potatoes. I cook them in olive oil and chicken stock; use vegetable stock for a vegetarian or vegan dish. The potato skins get brown and crispy, and the potato flesh becomes creamy and flavorful from the stock. I made a double batch, and served them with some chive-pistachio pesto mixed with sour cream. 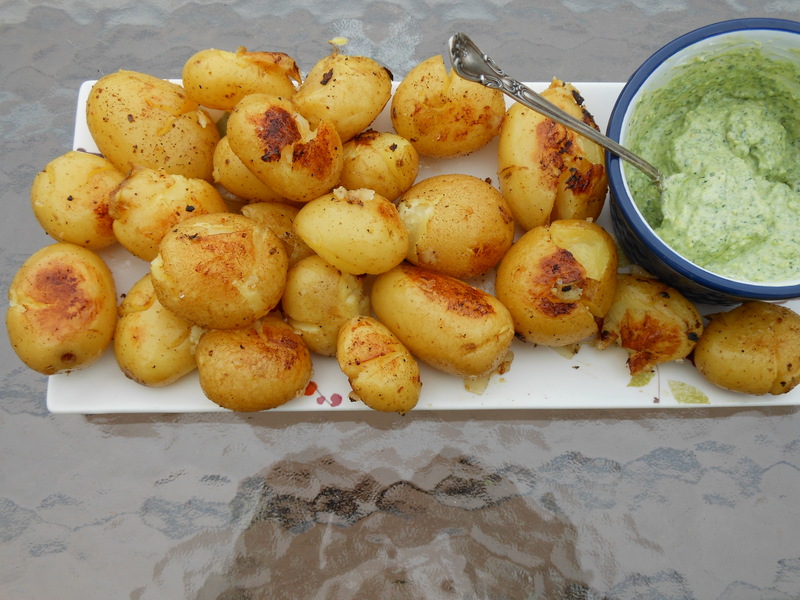 They’re also a perfect accompaniment to roast chicken with pan sauce, but can also stand on their own. The next night, I cut the leftover potatoes in half horizontally and browned them, cut sides down, in a little olive oil in a hot pan. The salty, crispy bites were just the thing with our turkey burgers. Scrub the potatoes, but don’t peel them. Dry them well. Place a potato on the cutting board and give it a good whack with a mallet. The goal is to initiate a crack or two, not to mash the potato into oblivion. Repeat with the remaining potatoes. Drizzle the oil in the bottom of a large skillet (preferably nonstick) and add the potatoes. It’s important that the potatoes fit in one layer; they won’t brown if they don’t have contact with the bottom of the pan. Season well with salt and pepper. Remove the lid and cook over medium-high heat until the potatoes are nicely browned on the bottom. You can serve them right a way, or flip the potatoes to brown on the second side. To cook any leftovers, split the potatoes in half horizontally. Warm a little olive oil in a skillet over medium-high heat. Add the potatoes, cut sides down, and cook until well browned, about 6 to 8 minutes. 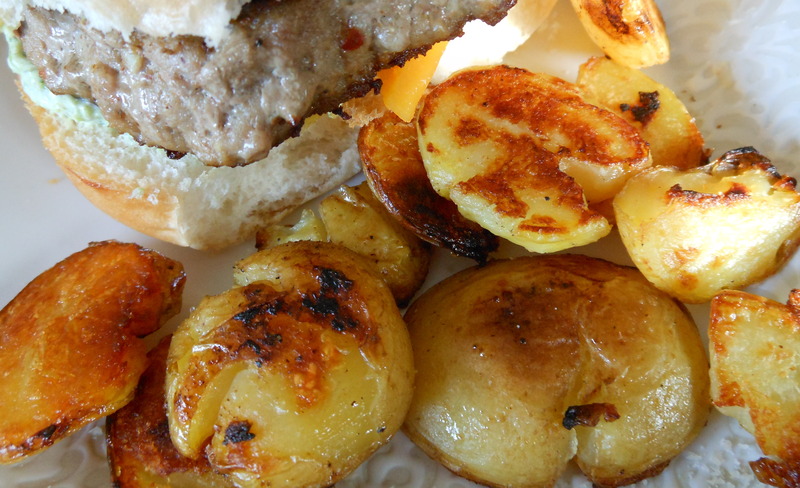 This entry was posted in sides and tagged healthy dishes, potatoes, roast potatoes. Bookmark the permalink. Oh jeez these look so goooooood. Potatoes are magic, are they not? Thanks, hon. Potatoes are indeed fabulous. I did a quick search for cracked potatoes and discovered your recipe! I am making them tonight, thanks! Made them for dinner and they were easy (except for the few that I smashed into oblivion) and delicious! Thanks again! Ah yes. There is that delicate balance between hitting them hard enough to crack them and smashing them to smithereens. Been there. So glad you liked them.